Production of the 3800 continued until 1988 when VéloSoleX stopped manufacturing mopeds. However, in 2004, the Cible Group purchased the brand and launched the e-Solex, an electric bicycle, notably designed by the famed Italian coachbuilder Pininfarina. The designers at Pininfarina wanted to hearken back to the look of the iconic 3800 model.As a nod to its gas-powered predecessor, what looks like the distinctive front fuel tank is actually a lockable storage compartment, which also supports the front headlight. 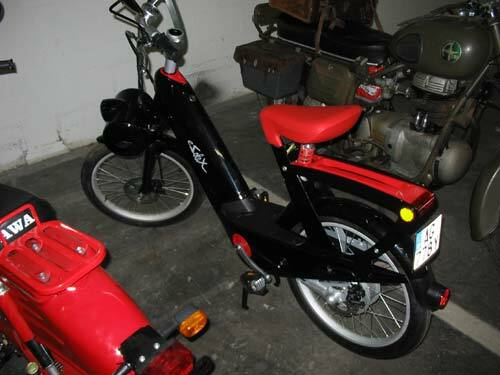 The e-Solex has a top speed of 32 kph (20 mph) in normal mode, with a range of 15 miles per charge, while the ECO mode uses less electricity, but is also less powerful. Top speed in ECO mode is 22 kph (17 mph), but one could travel up to 37 miles per charge. One nice feature about the e-Solex is that the 9-lb battery can be easily removed for charging in home or office. This allows one to lock the bike where convenient, even if there is, not an outlet nearby. Many e-bikes do not have a removable battery pack. Plus, being a bicycle at heart, when power runs out, one simply pedals the e-Solex home!